The most awaited summer is here and kids' schools are closed. I have my veggie garden setup and I am still working on my patio plants. My main chores after work on weekdays are cleaning up the garden. Weeds seems to thrive better than plants and our lawn, so it's hectic to keep things pretty. Besides weeds my nerve pulling visitor of my garden is deer. They started munching on my roses and even my hydrangeas this year. Hope they will find something else to satisfy their hunger and keep my plants alone. I had been pinning lots of great ideas from pinterest for the garden and been persuading my hubby to start the summer project for our garden. Hope I will be able to share some decent pictures of my garden soon. Kids were super excited when we bought the hummingbird feeder a week ago. The next day morning after hanging the feeder on a low height pole we noticed that the feeder was empty. There was no way humming birds would have finished all the nectar and we suspect the deer is the culprit, as we had caught them feeding on the bird seeds few weeks ago. 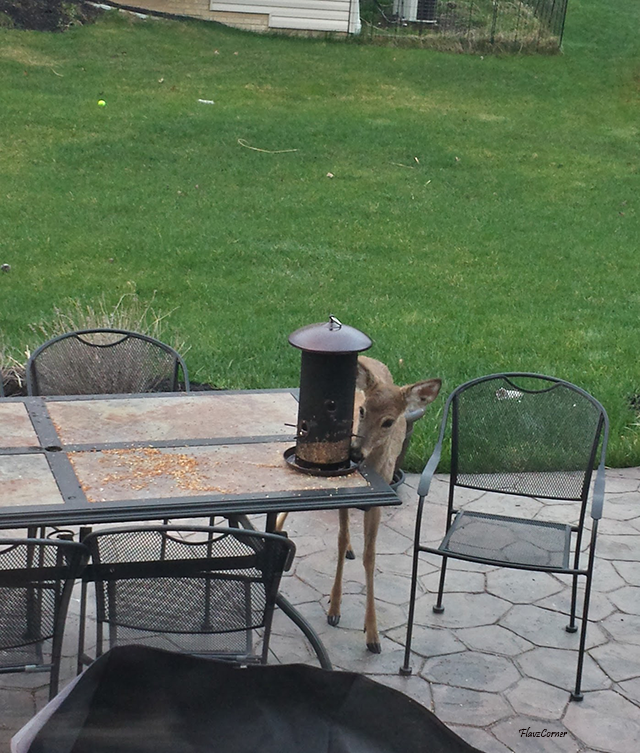 Deer having the breakfast...yes its from the bird feeder.. So now the hummingbird feeder is hanged much higher, but for kids' disappointment the level of the nectar has not changed and we didn't notice any humming birds yet. Last year I had lots of gladiolas in my garden and humming birds and butterflies were frequent visitors. Hope this year the deer will let my gladiolas bloom again. Summer time is packed with activities and busy weekends. So I usually cook something quick and easy to spend more time outside. But last week, I had some time off and made these Methi parathas and served them with some dum aloo (a mildly spicy & creamy dish made with baby potatoes and yogurt) for dinner. It was absolutely delicious and my daughter was savoring on the gravy of the dum aloo after she had her parathas. Mix all the ingredients from the above list in a mixing bowl of stand mixer. Attach the hook and knead for 5 - 6 minutes. Add extra flour if needed or till the dough form a ball which is not sticky anymore but soft and elastic. If not using stand mixture, mix the ingredients using hand and knead till a non sticky smooth elastic dough ball is formed. Cover the dough with a damp kitchen towel and let it rest for 30 minutes. Heat a tawa /cast iron flat pan or a flat pan. Keep the heat on medium. Divide the dough into 25 equal balls. Dust the rolling surface with wheat flour. Take the extra wheat flour is in a plate. Dip a dough ball in flour and roll into a flat round paratha (don't worry if it doesn't come out round). Place the rolled dough on the heated pan. Cook it for 1 minute on one side. Flip the side, you will see brown spots on top. Cook the other side till small brown spots appear. Remove from the pan and keep it in a caserole dish/ a dish with lid. Apply some ghee on top of the cooked paratha. 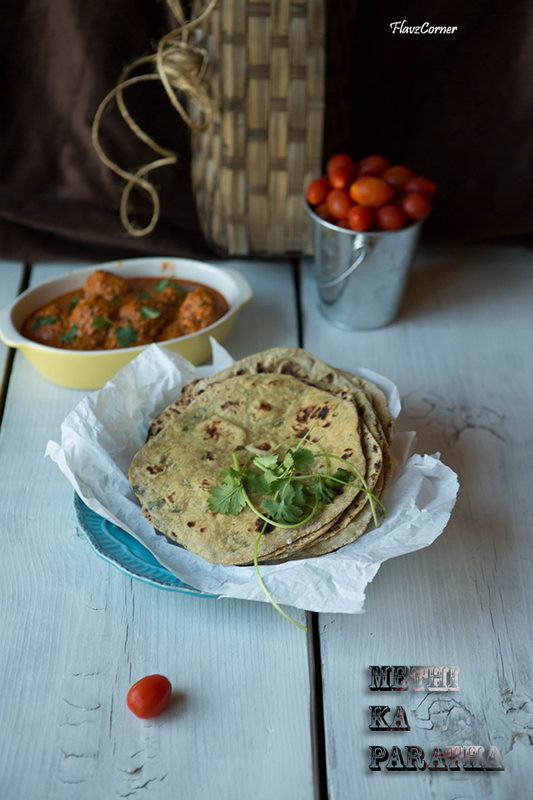 Make the rest of the parathas the same way. Enjoy with your favorite curry. You can get fenugreek leaves from Indian stores those carry fresh produce. If you are buying the bunch, use a kitchen scissors to clip the roots off before separating the bunch. This helps to get rid of most of the sand/dirt. 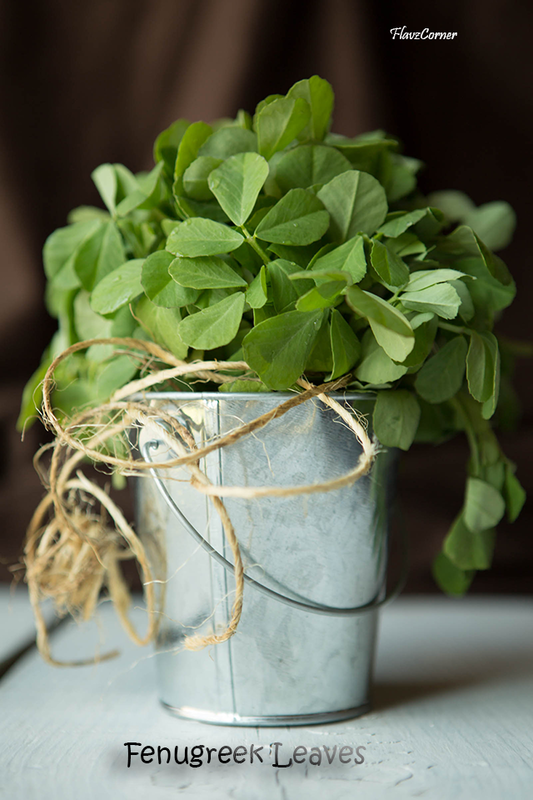 Make sure you wash the fenugreek leaves well to remove any dirt. After washing the leaves, drain them in a colander to remove water. Let them air dry for 10 - 20 minutes. You can either pluck the leaves or use a kitchen scissors to chop the leaves including the tender part of the stem. You can get chaat masala from Indian stores. yummy methi chapathi.. my fav. 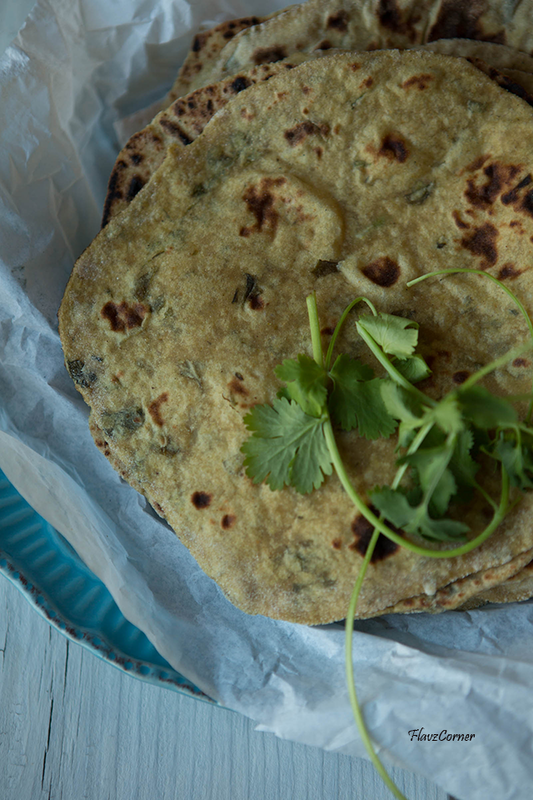 These methi paratha look fantastic! Beautiful rustic shots, Shibi. Deer will eat almost anything! We're not bothered by them, but have been in the past. They're pretty, though. Anyway, lovely dish -- fenugreek has such a nice flavor. Good post -- thanks. Methi paratha looks yum. Looks like the deer stole the show from methi. It is so irritating to see the crop simply chomped.May be a good hot water wash will remove the deer stench from bird feeder and attract the birds again. Wow... paratha looks delicious.. wow.. i have seen deers in anyone's garden like this... looks so cute.. do they do harm ??? I've never even heard of fenugreek leaves before! Learn someting new every day!!! And this flatbread looks beautiful!